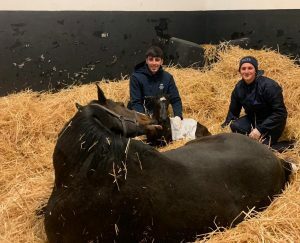 Millie Reed (GB) and Fabien Puchta (GER) give you an insight into their ninth week here on the Irish National Stud Thoroughbred Breeding Course. As the flat season truly gets underway, Invincible Spirit enjoyed his tenth winner over the weekend with Invincible Army. The dual Group 3 winning colt triumphed in the Unibet Cammidge Trophy Stakes at Doncaster by 2 lengths ahead of Major Jumbo, further showing signs of inheriting his sire’s sprinting prowess. The weekend also brought us the pinnacle of UAE race meetings, featuring nine high-class races every year on the last Saturday in March. We saw history being made in the Dubai World Cup, with Thunder snow making history as the only horse to have won the race not only twice, but also in back to back years since the race began in 1996. My week ( Fabian) started on a Tuesday. Coming from three nights of foal watch over the weekend, I got the Monday off to get back into a normal sleeping rhythm. From Tuesday on I spent my first week in Kildare Yard, where most the foals live, that stay on the farm. 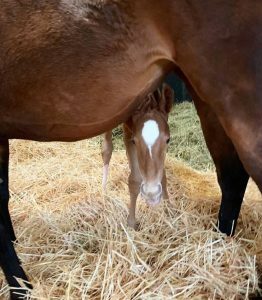 It was exciting to see how some foals have developed, since it been a little while the last time I saw a few of them, when I was in the Foaling Yard (Sun Chariot). We started earlier because it was muck out day. So we started off, teasing the mares that were on the list and then the vet checked them, to make sure we did not miss any. Bringing the foals out it was fun to see how some of them got really excited because they could not wait to get to their paddock, to buck and run around. Wednesday was one of the highlights during the course for me so far: we got to visit Con Marnane´s “Bansha House Stabels”. It was my first time getting a look behind the scenes at a racing yard and it sure is impressive to see the 2 and 3y olds galloping at full speed while you are just standing a meter away from them. He gave us a tour around his facilities showing us all the modern equipment he is using to get his horses ready for the breeze up sales. In the end he invited us to some cracking sausage rolls, ending a great day!